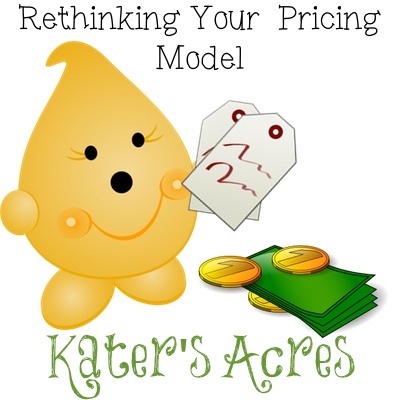 Every year after taxes are filed, I take a serious look at pricing, costs, etc for Kater’s Acres. While some things change, other things stay the same. This year after a detailed and heartfelt overview of Kater’s Acres I have (once again) had to make complicated decisions. SHIPPING FEES: One of which is that with the huge cost of shipping increases, I had to increase my shipping fees across the board. Shipping fees will now be in line with the actual costs of what an item costs to ship direct to you. I regret having to take this measure and I hope that many understand, but I can not continue to pay outright for shipping items, it was raising the cost of my items far too much; but don’t worry, there is good news too … keep reading. While I love the constant pricing model that I used to recommend to all businesses (that Etsy still recommends), I have realized that will absolutely not work for each and every handmade business or handmade item. Why? It is likely different for each store. Whether they are brick & mortar, local economy, local suppliers, resellers, vintage, etc. For me, my brand, & my clientele, the reason is simple: It doesn’t fit them. Period. I am a collectible figurine artist which tailors itself to a completely different clientele than many sculptors, painters, or other artisans. I am trying to reach a market of collectors of figurines which have a completely different pricing model. My new pricing structure reflects this model. This model is no longer based on the “time” element, but rather the elements included in something itself … doesn’t that mean I don’t get paid for 100% of my time, in some cases yes, is other cases, no. For example, for my larger & more detailed pieces, I still charge a price based on time as their details are far too intense (see Parker’s Bug Tea Light shown above). However, for my smaller StoryBook Scenes, my new pricing model is based on the number of elements in each StoryBook Scene, keeping much more in line with other collectibles. How did I come to this conclusion? The answer is simple: market research. I spent weeks researching other collectible figurine lines and saw a glaring similarity … each and every handmade collectible line that is succeeding is not using a “time based” pricing model, rather their pricing models are based on the number of elements or the size of each item. For many of these successful collectible lines, their have as few as 3 and as many as 5 price points. It is from these that I based my new pricing model. As with any business, this pricing model will once again be evaluated post tax season next year … but for now, I hope you will enjoy our NEW lower prices across the board. I invite you to head on over to Kater’s Acres and adopt a Parker or Lolly. Are you a handmade business owner? What pricing model or structure do you use and why? Share your pricing model below in the comments!